Whilst recent natural disasters such as the Great East Japan Earthquake of 2011 caused horrific physical damage and loss of life, they also demonstrated the fragility of today’s electricity systems. Major electricity outages around the world are growing in number and scope, bringing significant costs to local industry and the community. In the case of the recent Great East Japan Earthquake, over 8 million people were left without power, and it took 10 days to restore 95 % of the electricity supply to these customers. Another example of a significant outage was in India in 2012, which left more than 620 million people, or approximately 9% of the world’s population without electricity. In response to these recent large-scale power outages, the IEC commissioned the present White Paper with a view to examining how best to maintain disaster preparation and local electricity supplies after a large-scale blackout. The White Paper’s principal focus is on one of the most recent major developments facing the electrical power industry: the concept of the “microgrid”. 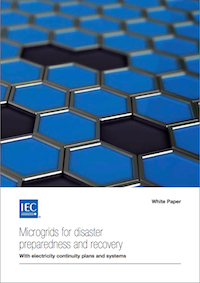 Whilst often viewed as a means for encouraging the uptake of renewable energy or for managing peak demand challenges on the broader electricity system, microgrids have particular characteristics that can help with disaster preparation and recovery, and these are explored throughout this White Paper.